Over the years I have come and gone. This profile is my current incarnation. I was once told that I am the wisest among men. This, I find to be an astounding assertion. It surely cannot be true. So I continue to engage in dialogue in the hope of finding someone wiser than myself, for I am not wise. I know nothing. By the gods, almost every day I find myself confused trying to understand the problems you moderns face. The wise country of New Zealand recently announced that students will receive a free year of university education. This, to me, is a triumph of modern society. 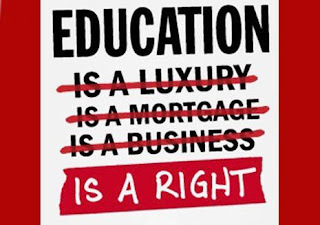 To be able to offer its people free education surely is the sign of a successful country. But people are complaining about it. People think this is a big problem. Why? Because the free education will be paid for by the government, which means it is made possible through taxation. And many people don't want to be paying for other people's education. They think people who want an education should pay for it themselves. In my usual style I questioned someone about this. I asked if premise #1 means that people should no longer receive the Christmas gifts they want. Good readers, I am sometimes astounded at the responses I receive from such questions. There is much anger in people. I wonder if anger is a symptom of the society in which we happen to live. I wonder if a more educated society might be a less angry society. I asked another group of people if they wanted to live in a good and happy society. With the common sense I expected, they replied in the affirmative. Of course they do. I then asked if they think improving the level of education in society would help make society better. They said yes and gave a number of reasons. For example, they think improved education leads to improved understanding of science and technology, which leads to improved health and happiness, which leads to a good and happy society. Perhaps unsurprisingly my deduction was received with scorn and anger. I am unsure whether this is because people don't like having the tension in their opposing beliefs exposed or whether they don't like the way I dress. Is it better never to have been? Is it just to kill animals for meat? Better Never To Have Been?